In France, they have TV shows about books! 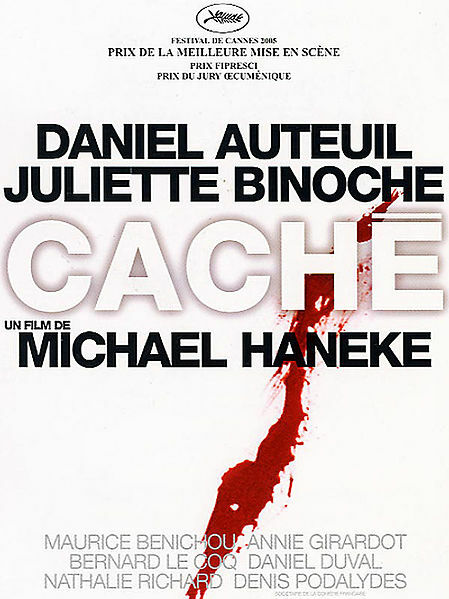 Hidden , or Caché as it was originally called in France, is in many ways a film I shouldn’t like. Indeed, before I sat down to watch it I read the brief description of the film on IMDB and frankly it filled me with dread. I resigned myself to a tough two hours of struggling through a beautifully shot though painfully dull French film. Within a few minutes though, I was completely hooked. What had hooked me? An opening shot of completely unexceptional Parisian apartment, held for about 3 minutes with nothing of any real interest or significance happening. The fact that something which on the surface was completely uninteresting intrigued me to the degree it did is the genius of Hidden and its writer/director Michael Haneke. It turns the mundane into the exceptional and the dull into the strange or odd. In Hidden a bourgeois, Parisian, upper middle class couple find themselves the victims of an odd campaign of intimidation. Someone is sending Georges and Anne surveillance tapes of the outside of their own home. The only clue as to why they are receiving the recordings are some ambiguous child-like drawings the tapes are wrapped in, drawings that seem to mean something linked to Georges’ past. Hidden is a thriller, with a plot that could easily be used for a bog-standard Hollywood run around. I can picture normal ‘Dad’ (a mid 90s Harrison Ford) pushed to the limit as he defends his family (attractive wife, attractive 18-year-old daughter and young son) from a sick psychopath intent on destroying their lives. Hidden takes this potentially cliché-ridden plot and uses it to produce a fascinating mediation on the way we perceive ourselves, our morals and how we relate to other people. Lewis was similarly enamoured by the film and we spend much of the podcast saying how great Hidden is, but in an entertaining way of course! We also get a bit carried away when talking about Annie Girardot, the actress playing the elderly mother of Georges. When researching the film I came across a picture of Annie from the late 50s/early 60s when she was stunningly beautiful. See here for evidence: http://www.imdb.com/media/rm3893275392/nm0320760. If our review has piqued your interest in the film, you can buy the Hidden DVD from Amazon by clicking here (and we get a little bit of cash if you do – thanks in advance).